Satisfy your hunger any time with a huge selection of deli favorites. 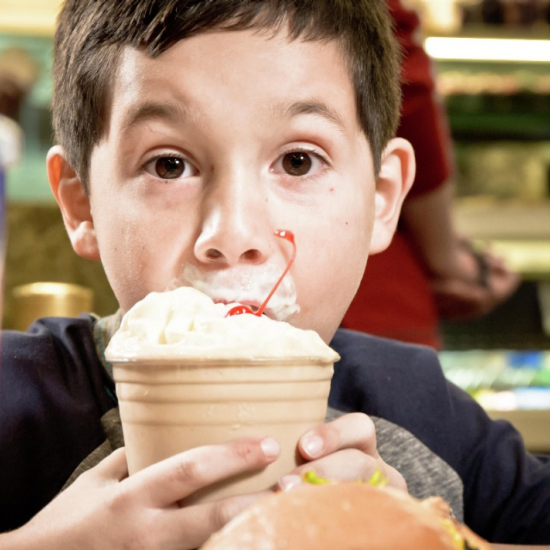 Bite into a fresh, made-to-order deluxe deli sandwich, enjoy our fresh soups and salads, a foot-long hot dog, or a variety of breakfast options. That's not all, it also features burgers, fries, chicken tenders and grilled chicken along with all of your original cold cut favorites. The Westside Deli is open 24 hours a day, 7 days a week so when hunger strikes, we've got you covered. Two buttermilk pancakes served with a side of maple syrup. Add bacon or sausage for additional charge. Scrambled eggs with hash browns, bacon, or sausage and toast. Egg and cheese on a bagel or english muffin. Add bacon, ham, or sausage for an additional charge. Choice of croissant, muffin, donut holes, danish, cinnamon roll, or bagel with cream cheese. Oatmeal and cold cereal served with milk. A serving of fresh, seasonal fruit. Chicken noodle or soup of the day. Crisp Romaine lettuce, toasted croutons, shredded parmesan cheese, and caesar dressing. Add chicken for additional charge. Crisp greens, veggies, oven roasted turkey, baked ham, cheddar and swiss cheese. Choice of ranch, thousand island, italian, or french dressing. Crisp greens, veggies, and toasted croutons. Add tuna or chicken for an additional charge. Oven roasted turkey, baked ham, corned beef, pastrami, tuna salad, or chicken salad. White, wheat, rye, or sourdough bread. American, swiss, provolone, or pepperjack cheese. Lettuce and tomato. Triple decker of bacon lettuce, and tomato on toasted white bread. Oven roasted turkey, baked ham, roast beef, american or swiss cheese, lettuce, tomato, and red onion on a french roll. Traditional triple decker with oven roasted turkey, bacon, lettuce, and tomato on toasted white bread. Oven roasted turkey, bacon, tomato, and melted swiss cheese on french roll. Corned beef and pastrami with swiss cheese, coleslaw, and thousand island dressing on rye bread. Ham, salami, pepperoni, provolone cheese, shredded lettuce, tomato, and onion. Served with tomato bisque soup. 100% black angus beef served on a toasted brioche bun. Add choice of american, swiss provolone, or pepperjack cheese for an additional price. Grilled chicken breast served on a toasted brioche bun with lettuce and tomato. Add choice of american, swiss, provolone, or pepper jack cheese for an additional price. A garden vegetable patty on a toasted whole wheat bun with lettuce, tomato and onion. Served with fresh chopped fruit. Thinly sliced roast beef with grilled peppers and onions with white cheddar cheese on a toasted french roll. Roast beef and provolone cheese served on a french roll with hot au jus. Three (3) BBQ pork sliders on a parker house roll with coleslaw. Sabrett's foot long beef hot dog. Three (3) piece order of chicken tenders. Choice of vanilla, chocolate, strawberry, strawberry cheesecake, or oreo cookie. Turn right from entrance towards the Avis Rent-A-Car desk. Then turn left. Continue straight between Adventure Tours Desk and West Casino. Westside Deli will be in the right hand side. Curve around Main Casino then continue straight, passing Krispy Kreme. Continue straight passing Circus Buffet, then curve left. Turn left between Adventure Tours Desk and West Casino. Westside Deli will be in the right hand side. Enter from the 3rd floor Promenade level then continue straight, passing Buffalo Old Time Photo Co. Turn right to take stairs/escalator down to casino level. Turn right, then turn left between Adventure Tours Desk and West Casino. Westside Deli will be in the right hand side.